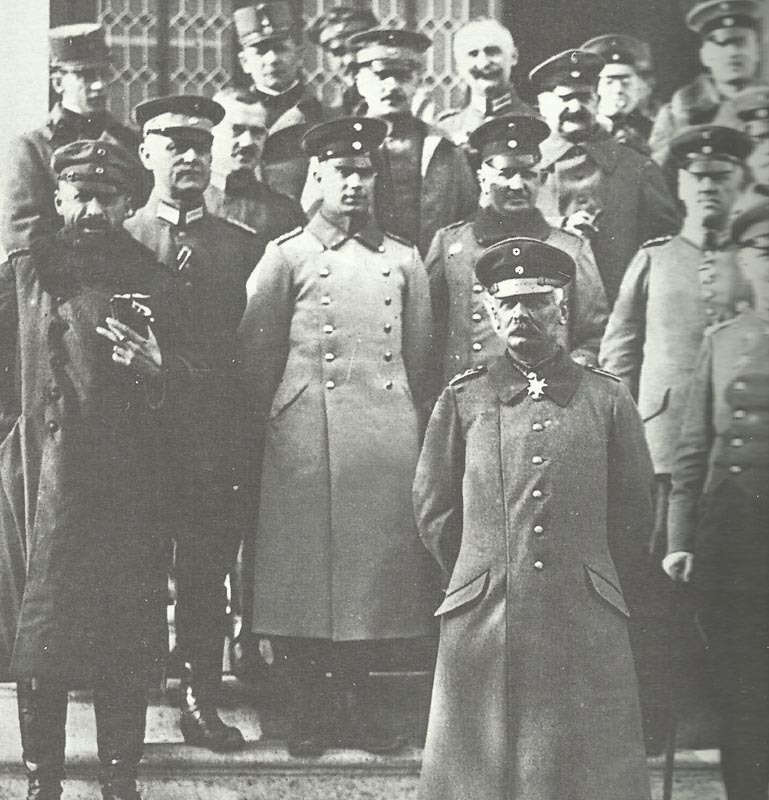 Falkenhayn (in front), ex-chief of the German General Staff, as commander of the Ninth Army with some of his officers. Brusilov offensive, Galicia – Second Battle of the Narajowka and Zlota Lipa (until September 17): 4 Russian divisons with gas attack Turk XV Corps which holds despite c.5,000 casualties. Transylvania: Rumanian Second Army occupies Baraoltu dominating Kronstadt­-Foldvar railway 30 miles from frontier. Ex-CoS Falkenhayn takes command of Ninth Army. Dobruja: Mackensen attacks Rasova-Tuzla line (until September 20), but retires to re-stock with heavy shell. Turk 25th Division repulses Rumanian counter-attacks on September 22. Battle of the Somme: British repulse counter-attack near Courcelette, but 5 German relief divisions now oppose exploitation. Allies capture Dunibe Trench. NZ Division advances north and west of Flers. Hindenburg arrives at Cambrai, orders construction of semi-permanent defence line (5-30 miles) to the rear (Hindenburg Line). Isonzo: Italians capture San Grado di Merna, Hill 208S, and all of Hill 144, but fail to take Hill 123 and Veliki Kribach farther east. Macedonia: Serbs fighting Bulgars in forest on Mt Kajmakcalan foothills (until September 18). Germany: A German-led Central Powers Supreme War Council agreed but Emperor Charles revokes Austrian signature after November 21. Germany: Navy airships L6 and L9 destroyed in accidental fire on ground. Western Front: Royal Flying Corps aircraft and balloon collide with fatal results. Italy: Lieutenant Colonel Douhet, CoS Italian 5th Division and air power advocate, arrested for writing strong criticisms of Commndo Supremo to War Minister; court-martial imprisons him for a year from October 15. Germany: 39 industrialists tell War Ministry workers cannot exceed 9 hours per day. Army to release skilled workers and ‘open the great Belgian labour basin’. Britain: Churchill to Fisher: ‘My poor land battleships have been let off prematurely and on a petty scale. In that idea resided one real victory’.